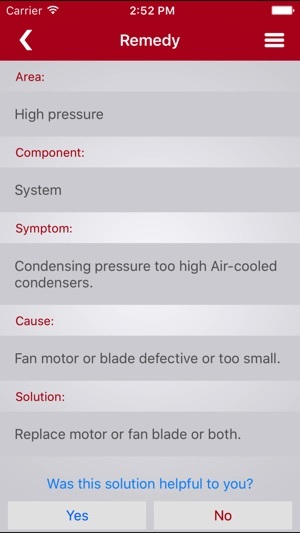 The Trouble Shooter is based on the popular and informative Fitters Notes that you can find on the Danfoss website http://refrigerationandairconditioning.danfoss.com/knowledge-center/. The app is available to download as part of the Danfoss CoolApp™ library, which already includes the very successful Refrigerant Slider. 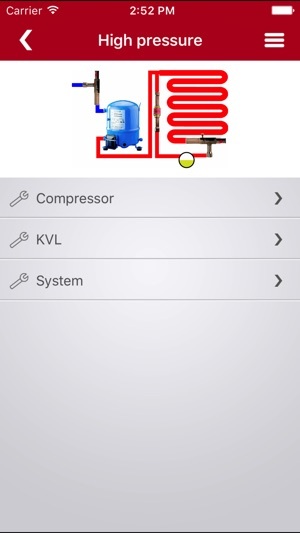 Trouble Shooter gives you instant access to knowledge about refrigeration applications and their functions supporting your day to day work when servicing your customers’ systems. 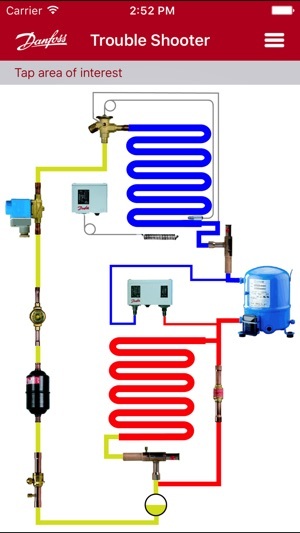 When starting up Trouble Shooter, you will be presented to a refrigeration system divided into four main areas: low pressure, high pressure, compressor and liquid line components. You select an area and next you will be able to search symptoms in the system. Once correct symptom is identified you will be presented to possible causes of this symptom and procedures required to correct it. It’s easy to move back and forward between the symptom/cause and remedy pages. Trouble Shooter’s database is available at all times and does not require Wi-Fi to give full app functionality. Danfoss engineers technologies that enable the world of tomorrow to do more with less. We meet the growing need for infrastructure, food supply, energy efficiency and climate-friendly solutions. 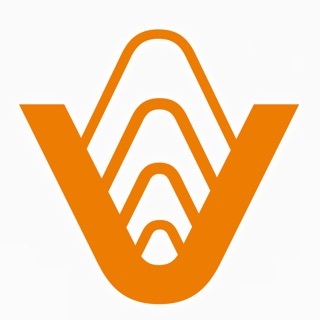 Our products and services are used in areas such as refrigeration, air conditioning, heating, motor control and mobile machinery. We are also active in the field of renewable energy as well as district heating infrastructure for cities and urban communities. Our innovative engineering dates back to 1933 and today Danfoss is a world-leader, employing 22,500 employees and serving customers in more than 100 countries. We are still privately held by the founding family. Read more about us at www.danfoss.com. The Trouble Shooter (“the Application”) is provided on an “as is” and “as available” basis for the intended purposes as determined by Danfoss only and any use hereof is at the user’s sole risk. 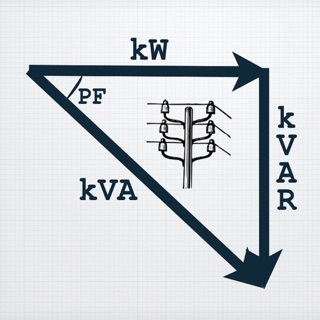 The Application and results and information generated thereby cannot substitute technical advice but must be verified by the user, they are not promises and should not be relied on as accurate data or analyses. 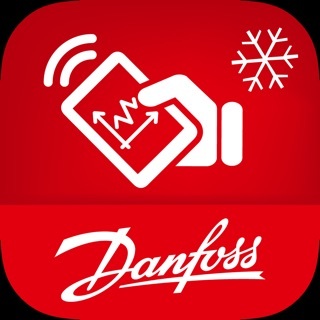 Please visit www.danfoss.com for more information and contact details.